When it comes to buying an inflatable hot tub there are not to many things to consider, however there are usually a lot of questions people have, and we are here to help. We have put together the ultimate buying guide when it comes to splashing out this summer on an inflatable hot tub. So without further a do, lets go! Size – How man people do you want to hold, and how much space do you have. If space isn’t an issue then you can get a hot tub that can hold anywhere from 2-4 up to 8 people. The bigger the hot tub the increase in price, and also water to fill, so do think how many people will be in it at any one time, it may just be you and your partner so one that hold 4 people would be ideal. However if kids or friends are going to be joining you then a larger size would be better. Space – The great things with inflatable hot tubs is that you can use them indoors or out, whichever you choose you shall need some space to fit one. One of the smallest hot tubs on the market is the Lay-Z-Spa Miami Inflatable Hot Tub Spa at 180cm wide. All you need is a space for this that is level and flat, this could be your patio, decking area, lawn, or perhaps inside in your conservatory. Where ever it is just make sure you know where it will be going and you have measured to ensure it fits. If space isn’t an issue then remember with inflatable hot tubs they are easy to move, just drain it, deflate it, and then move it to wherever you desire, ideal if you start using it as the same time most days as you may wish to move it to catch the evening sun too perhaps. Plug Socket – Inflatable hot tubs come with a plug on the end which plug straight into an plug socket like any other household appliance so there is no need for any special wiring, just ensure you have one free near a window or door, and also that it will reach as we don’t advise using an extension lead. 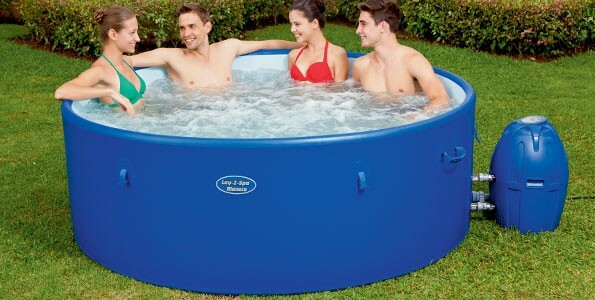 The Lay-Z-Spa hot tubs come with a 10m lead, which should be suitable for most people and locations. Quick and Easy – All portable hot tubs are quick and easy to set up, they will come with simple to read instructions, and some have a useful DVD is help get you started. But it really is as simple as inflating, connecting up the pump, and filling it with water. There is no need for any special tools, expert installers or knowledge, it really is that simple. You can have it all set up and have it filling with water in 10-15 minutes. Easy. Inflating – We advise when it comes to inflating your hot tub, to not to over inflate it at the start. The reason for this is the water, heat and sunlight on the spa shall increase the pressure, so once it is all filled up and heated, you can then easily add or remove air if needed to make it comfortable to relax in. If you have a black hot tub then the sunlight will cause this to heat up so do bear this in mind too. Heating – Once filled your hot tub can take between 12-24 hours to heat up, this will depend on the outside temperature, and also mainly how much water there is, the bigger the hot tub, the more water there is to heat. Maintenance – All hot tubs come with a guide on how to keep your hot tub clean, there are filters that help keep the water clean which will need changing, there are also chemicals to prevent micro-organisms from infiltrating your water. Although there is a little to do to keep it running and clean, it is a lot less then is required with a traditional jacuzzi. What if you get a puncture? – There is always the what if? The material of the inflatable hot tub is very strong, however there maybe a stray nail on the decking perhaps, all Lay-Z-Spas come with a repair kit for the just incase eventuality, so don’t worry! We answer your common questions regarding inflatable hot tubs. Everything you need to get you started comes in the box when you buy your inflatable hot tub. The only other things needed are new filters and chemicals for when maintaining your spa, so it is always good to buy these at the same time so you don’t forget, although you won’t need them right away. How warm do they get? Most inflatable spa’s will heat up to 40 degrees which is usually more than warm enough for most people, there is a temperature control so you can reduce this too. How Long does it take to fill the spa, and heat it? Depending on the size of your hot tub and your water pressure, it can take 1-2 hours to fill the spa, and then again depending on the size it can take 12 hours plus to heat it. Will it heat quicker with the jets on? No, intact it will cool the water, the air from the jets and bubbles will cool the water, so ensure they are off when heating. You certainly can, however Lay-Z-Spa advise that the spa should not be setup or left out in temperatures lower than 4 degrees (40F) as the water may start to freeze and cause damage to the pump making it unusable. So although it can be used and would certainly be relaxing to use in the winter months, just ensure if is was protecting from freeing temperatures. Yes you can, however there are a few extra things to consider, the floor, can it hold the weight, what if the flooring gets wet when getting out, or draining it? Will the flooring be ok? So although it can be used indoors, you need to think about the practical side and use of this. It certainly is, just drain the water and deflate, pack it away in its box and store in a dry place ready for next Summer. When draining it though do take some time to give it a good clean and scrub down, it shall make things a lot easier for the next time you bring it out. Do Inflatable Hot Tubs Have Seats? No, inflatable hot tubs don’t tend to have any sort of seat, however they do have a cushioned base which makes it comfortable to sit on. As there are no designated seats it makes it easier for more people to get in and enjoy, and it is also more comfortable to spread out and move around in depending on how many are in it. 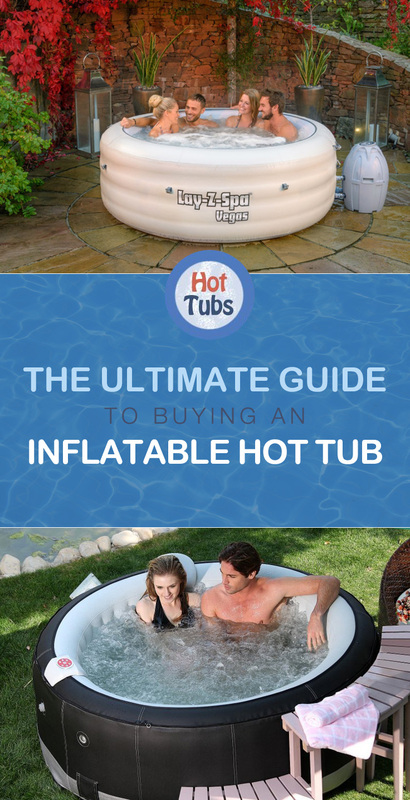 Check out our reviews and guide to some of the most popular inflatable hot tubs here. When you are looking for this kind of product, you have to ask a few questions to ensure that you make the right choice. The first most important question to ask is how much should such an inflatable hot tub cost before you make your choice. There are varieties on the market and the price they are sold varies. You have to make your budget before going to the market; this can help resolve this question. Another important question to ask is what size of the inflatable hot tub should I look for? It is already explained that the bigger the better. However, you should know that it can cost more to have bigger models and it can demand more chemicals and so on. The third likely question you should ask is how much space the product should take. This is important because compare the available space in your home and consider whether it accommodates the product when you get it. Furthermore, ask yourself whether you can set it indoors or outdoors. If you want to set it indoors, it is left for you to make your choice, but consider the available space and ventilation system in your home. The other question you have to deal with has to do with electrical supply. You have to know the type of wiring arrangement for it before you can make your choice. These are some important questions to ask and these can assist you make the correct choice. These are the best inflatable hot tubs on the market, think about which suits you best and then when it arrives you can kick back and relax. Do you have inflatabel toppen to The Laz-y spa Vegas. I have a Lay z Spa. Living in Eastern Canada, it is very hard to find replacement parts.